Seminary Library Guessing Contest! Plus, 4th quarter books added in 2017! It’s time we restored the annual PRC Seminary library guessing context! I believe I have been remiss for a least one year, maybe more. So, on this Friday night, after giving my final 2017 library report to the Theological School Committee yesterday, we can throw the BIG QUESTION out to you: HOW MANY BOOKS were added to the Seminary library in 2017? And, in the interests of having TWO contest winners this year, we add a bonus question: How many TOTAL RESOURCES do we now have in our library? That means books, pamphlets, and periodicals, cataloged in the library system. Think long, think hard, and guess right! The closest to the actual numbers – calculated by our infallible library program, Resourcemate – wins the prize! Let’s give this contest one week – have your answer in by NEXT WEEK FRIDAY, please. You may submit your guess either to my email address or in the comment section of the blog. Have fun! Be a good sport! Opening Up the Bible: Opening Up Proverbs / Jim Newheiser. Leominster, England: Day One Publications, 2008. Mighty to Save: A Study in Old Testament Soteriology / T. V. Farris — 1st-hc. — Nashville, TN: Broadman Press, c1993. The Law and the Prophets: Old Testament Studies Prepared In Honor Of Oswald Thompson Allis / Oswald T. Allis, (Oswald Thompson) , 1880-1973; John H. Skilton; Milton C. Fisher — 1st-hc. — Nutley, NJ: Presbyterian and Reformed Pub. Co., 1974. Ruth : A New Translation With Introduction, Notes, And Commentary / Edward F. Campbell, (Edward Fay); William F. and Daniel N. Freedman Albright. — 1st-hc. — Garden City, NY : Doubleday, 1975. As Rich as Job / C. Bijl — 1st Engl – pb. — Kampen : Van den Berg, 1989. Heirs of Paul : Paul’s Legacy in the New Testament and in the Church Today / Johan Christiaan Beker — 1st-reprint-pb. — Grand Rapids, MI; Cambridge, U.K. : William B. Eerdmans Pub., 1996, c1991. James: Bible Study Commentary / Curtis Vaughan. — 1st-pb. — Grand Rapds, MI : Zondervan, 1969. The Overcomers: The Unveiling of Hope, Comfort, and Encouragement in the Book of Revelation / Chuck Colclasure; D. James (Dennis James) Kennedy, 1930-2007. — 1st-pb. — Nashville: T. Nelson Publishers, c1981. The Apocalypse: A Reading of the Revelation of John / Charles H. Talbert — 1st-pb. — Louisville, KY: Westminster John Knox Press, c1994. Twentieth-Century Dictionary of Christian Biography / James D. Douglas; A. Scott Moreau; Walter A. Elwell. — 1st-hc. — Carlisle, Cumbria, England/Grand Rapids, MI: Paternoster Press; Baker Books, c1995. Martin Luther: The Man Who Rediscovered God and Changed the World / Eric. Metaxas. — 1st-hc. — New York: Viking, 2017. Katie Luther, First Lady of the Reformation: The Unconventional Life of Katharina Von Bora / Ruth Tucker — 1st-pb. — Grand Rapids, MI: Zondervan, 2017. Dictionary of Luther and the Lutheran Traditions / Timothy J. Wengert, ed. ; Mark A. Granquist; Robert Kolb — 1st-hc. — Grand Rapids, MI: Baker Academic, 2017. Heralds of the Reformation: Thirty Biographies of Sheer Grace / Richard M. Hannula — 1st-pb. — Moscow, ID: Canon Press, 2016. Wittenberg Meets the World: Reimagining the Reformation at the Margins / Alberto L. Garcia; John Nunes. — 1st-pb. — Grand Rapids, MI: William B. Eerdmans, 2017. For Christ’s Crown: Sketches of Puritans and Covenanters / Richard M. Hannula. — 1st-pb. — Moscow, ID: Canon Press, 2014. Galley Slave / Jean Marteilhe, 1684-1777; Vincent. McInerney. — abridged reprint-hc. — Barnsley: Seaforth, 2010 (a Huguenot story). Cosmos in the Chaos: Philip Schaff’s Interpretation of Nineteenth-Century American Religion / Stephen Ray Graham; Martin E. Marty — 1st-pb. — Grand Rapids, MI: William B. Eerdmans, c1995. Faith of Our Fathers: A Popular Study of the Nicene Creed / L. Charles. Jackson. — 1st-pb. — Moscow, ID: Canon Press, c2007. Was the Reformation a Mistake? Why Catholic Doctrine Is Not Unbiblical / Matthew Levering; Kevin J. Vanhoozer — 1st-pb. — Grand Rapids, MI: Zondervan, 2017. From the Protestant Reformation to the Southern Baptist Convention: What Hath Geneva to Do With Nashville? / Thomas K. Ascol; Roger Nicole — Revised-hc. — Cape Coral, FL: Founders Press, 2013. Whatever Happened to the Reformation? / Gary L. W. Johnson; R. Fowler White; R. C. (Robert Charles) Sproul — 1st-pb. — Phillipsburg, NJ : P & R, c2001. Martin Luther and the Seven Sacraments: A Contemporary Protestant Reappraisal / Brian C. Brewer. — 1st-pb. — Grand Rapids, MI : Baker Academic, 2017. Roman But Not Catholic: What Remains at Stake 500 Years After the Reformation / Kenneth J. Collins. ; Jerry L. Walls. — 1st-pb. — Grand Rapids, MI : Baker Academic, 2017. Studies in Reformed Theology and History: The Disputations of Baden, 1526 and Berne, 1528: Neutralizing the Early Church / Irena Backus; David Willis-Watkins. — Winter 1993-pb. — Princeton Theological Seminary. Wrongly Dividing the Word of Truth: A Critique of Dispensationalism / John H. Gerstner; R. C. (Robert Charles) Sproul; Don Kistler — 3rd-pb. — Draper, VA: Apologetics Group, 2009. The Gospel of Free Acceptance in Christ: An Assessment of the Reformation and ‘New Perspectives’ on Paul / Cornelis P. Venema — 1st-hc. — Edinburgh : Banner of Truth Trust, c2006. Getting the Garden Right: Adam’s Work and God’s Rest in Light of Christ / Richard C. Barcellos; Thomas K. Ascol — 1st-pb. — Cape Coral, FL: Founders Press, 2017. The Pathway of Holiness: A Guide for Sinners / John White, 1924 – 2002. — 1st-pb. — Downers Grove, IL: InterVarsity Press, c1996. Gleanings in the Scriptures: Man’s Total Depravity / Arthur W. Pink, 1886-1952. — 1st-hc. — Chicago: Moody Press, 1969. The Royal Priesthood of the Faithful: An Investigation of the Doctrine from Biblical Times to the Reformation. / C. Cyril (Charles Cyril) Eastwood — 1st-hc. — Minneapolis, MN: Augsburg Pub. House, 1963. The Priesthood of All Believers: An Examination of the Doctrine from the Reformation to the Present Day / C. Cyril (Charles Cyril) Eastwood — 1st-hc. — Minneapolis, MN: Augsburg Pub. House, 1962. Made in America: The Shaping of Modern American Evangelicalism / Michael Scott. Horton. — 1st-hc. — Grand Rapids, MI: Baker Book House, c1991. You Are What You Love: The Spiritual Power of Habit / James K. A. Smith — 1st-hc. — Grand Rapids, MI: Brazos Press, 2016. Introducing Protestant Social Ethics: Foundations in Scripture, History, and Practice / Brian J. Matz. — 1st-pb. — Grand Rapids, MI : Baker Academic, 2017. Portraits of a Pastor: The 9 Essential Roles of a Church Leader / Jason K. Allen. ; Daniel L. Akin; Jared C. Wilson; Jason K. Allen — 1st-pb. — Chicago: Moody Publishers, 2017. Counseling Under the Cross: How Martin Luther Applied the Gospel to Daily Life / Robert W. Kellemen — 1st-pb. — Greensboro, NC : New Growth Press, 2017. The Taste of Sabbath: How to Delight in God’s Rest / Stuart W. Bryan. Moscow, ID: Canon Press, c2009. Let the Waters Roar: Evangelists in the Gulag / G. P. Vins, (Georgii Petrovich) — 1st-pb. — Grand Rapids, MI: Baker Book House, c1989. Race and Redemption: British Missionaries Encounter Pacific Peoples, 1790-1920 / Jane Samson; R.E. and Brian Stanley Frykenberg, eds. — 1st-pb. — Grand Rapids, Michigan : William B. Eerdmans Publishing Company, 2017. What Is Anglicanism? / Urban T. Holmes, III , 1930-1981. — 1st-pb. — Wilton, Conn. : Morehouse-Barlow Co., c1982. Reaching Muslims for Christ / William J. Saal; Warren W. Wiersbe — 1st-pb. — Chicago : Moody Press, 1993, c1991. The Mission of the Church: Five Views in Conversation / Craig Ott, editor. ; Stephen B. Bevans; Darrell L. Guder — 1st-pb. — Grand Rapids, MI : Baker Academic, 2016. Engaging the Culture, Changing the World: The Christian University in a Post-Christian World / Philip W. Eaton — 1st-pb. — Downers Grove, IL: IVP Academic, c2011. Good News of the Kingdom Coming: The Marriage Of Evangelism And Social Responsibility / J. Andrew. Kirk. — 1st-pb. — Downers Grove, Ill. : InterVarsity Press, c1983. What Is Creation Science? / Henry M. Morris, 1918-2006. ; Gary. Parker. ; Dean H. Kenyon. — Rev. & expanded-pb. — El Cajon, CA: Master Books, c1987. Refuting Evolution 2 / Jonathan D. Sarfati — 1st-pb. — Green Forest, AR : Master Books, c2002. The Sacred Search: What If It’s Not About Who You Marry, But Why? / Gary Thomas. — 1st-pb. — Colorado Springs, CO : David C Cook, 2013. Last Saturday (Dec.30, 2017) Jon Bloom, a staff writer at “Desiring God” ministries, penned a post on “How (Not) to Read Next Year.” It is a helpful guide with valuable counsel as you make plans to “take up and read” in 2018. Now, if you are looking for things to read in 2018, fellow WordPress blogger Nick Roark just published his “best books I read” list for 2017. It is one of the best lists by a Christian reader out there, with something for everyone – even birders and baseball lovers! Surely you can make a choice or find an idea from this fine collection of 36 titles. By all means, check it out! As is their custom this time of year, the people at AbeBooks have posted their most expensive book sales for 2017. You might be surprised to see what led the way. Literary icon J.D. Salinger wears the crown as AbeBooks’s most expensive sale of the year. The American author scores extra points for appearing again at number 11. A signed poster – not a book – comes in at number two. Notable sales also included Dali and Picasso, three helpings of wizards and orcs, some vicious plants causing mayhem, ruins in the Middle East, a catcher (and not the baseball variety), and a book containing the first mention of ‘I think, therefore I am’. It was another great year for collectors. And this is the first title – check out the rest at the link above! 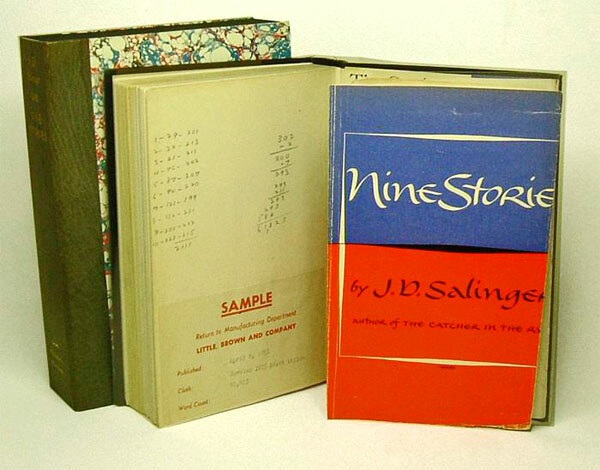 A unique edition of Salinger’s second work, this was Little Brown & Company’s only file copy. The publisher’s penciled word count calculations (61,823) and pasted label stating ‘Sample – return to manufacturing department’ can be seen on the rear free endpaper. Do you have a rare edition of a classic lying around the house? Or maybe you are on the prowl at the local thrift stores? That unique item could catch you thousands! It’s time for another list of the best Christian books of 2017, and this time we can turn to one of the best because Tim Challies’ list is a collected list – gathered from various Christian sources, such as The Gospel Coalition, Desiring God, Kevin DeYoung, Christianity Today, – and pulled together in one place. Here is his introduction with a few of the top books found on several lists; then be sure to visit his site and check out many more! And, yes, if you are still shopping for a family member or friend, these lists contain some excellent choices! But, of course, you may also shop for you and add to your personal library. For the past couple of weeks my RSS feeder has been humming with list after list of the best books of 2017. It seems that just about every avid reader I follow is eager to share his or her picks for the year that was. I love these lists and decided I’d compile them to look for patterns and repeats. Here, then, are the collected best Christian books of 2017. Each one of these is from a blog or web site I read regularly. If you are looking for something to read or something to buy for a gift, you probably can’t go wrong with any of them! And now here are each of lists of the best Christian books of 2017. You can visit the sites to read the rationales or to purchase the books. Alternatively, I’ve supplied links to Amazon. It is indeed that time of year when we see postings on websites and blogs for the best books of the year. Over the weekend Tony Reinke of Desiring God posted his, so we will start with that one this week. In the weeks to come we will post more. We do this so that you may see what other Christians suggest for the benefit of your own reading and library-building, but also so that you may have some gift ideas for your holiday shopping. Below is Reinke’s introduction to this list, followed by a paragraph I think our readers will find of interest (note the reference to Abraham Kuyper). By the way, Reinke himself has a good one published this year – 12 Ways Your Phone Is Changing You. Once again, I’m honored to choose my favorite nonfiction Christian books published in the last calendar year, my twelfth consecutive list. 2017 proved to be the most difficult year yet (and I’m sure I said the same thing last year), all driven by aggressive publishing momentum. This year about 120 new titles caught my attention, and I set out to read the best of them until I could whittle down a list of my 17 favorite reads from the year. But before getting to the list, a few overall comments. Female authors continue publishing new books at a swift pace, strong in 2014 and a little less prominent in 2015, but with more steam in 2016 and 2017. Women are now a mainstay and growing proportion of Christian publishing. Christian publishing continues to deliver on aesthetics across the board, both on cover design and interior design, illustrated by projects like the ESV Illuminated Bible from Crossway and the beautiful Lost Sermons of C.H. Spurgeon series (volume 1 and volume 2) from B&H. Once again, 2017 did not quite deliver biblical theology or commentaries like we saw in 2015, although we do continue to see solid contributions in two premier series: New Studies in Biblical Theology (IVP) and Short Studies in Biblical Theology (Crossway). Several significant books in 2017 again attempted to unknot the questions over how Christians best relate to politics and society (no small task). The most talked about book of the year was Rod Dreher’s The Benedict Option, a strategy of withdrawal from culture in order to better engage with it. Also noteworthy was James K.A. Smith’s Awaiting the King: Reforming Public Theology, a call to return to a robust Augustinian and Kuyperian model in all its glory. Speaking of Abraham Kuyper, Craig Bartholomew wrote a captivating book, Contours of the Kuyperian Tradition: A Systematic Introduction (a book I reviewed for The Gospel Coalition). And 2017 marked the midpoint in Logos/Lexham Press’s ambitious English-translation work of the 12-volume Abraham Kuyper Collected Works in Public Theology.